The United States began to expand west during the middle eighteen hundreds. People settled in the great open areas of the Dakotas, Utah, Wyoming, and California. The movement forced the nation to deal with great tribes of Native American Indians. The Indians had lived in the western territories for hundreds of years. Settlers and cattle ranchers pushed the Indians out of their homelands. The result was a series of wars between the tribes and the federal government. This week in our series, Steve Ember and Sarah Long tell about some of these conflicts. STEVE EMBER: At first, the United States government had just one policy to deal with the Indians. It was brutal. Whenever white men wanted Indian land, the tribes were pushed farther west. If the Indians protested, or tried to defend their land, they were destroyed with crushing force. By the middle eighteen-hundreds, almost all the eastern Indians had been moved west of the Mississippi River. They were given land in Indian territory in what is now the state of Oklahoma. The government described these Indians as "civilized." This meant they were too weak to cause more trouble. Many agreed to follow the ways of the white men. SARAH LONG: The Indians of the western grasslands were different. They refused to give up their way of life. These plains Indians were always on the move, because they hunted buffalo -- the American bison. They followed great groups of the animals across the grassy plains. At that time, there were millions of these animals in the American west. The Indians of the plains depended on the buffalo for almost everything they needed. Many of them were fierce fighters. The plains Indians did not want white men crossing their hunting lands. They often tried to destroy the wagon trains carrying settlers to California and Oregon. STEVE EMBER: The United States army was given the job of keeping peace. Soldiers were sent to build roads and forts in the western plains. They tried to protect the wagon trains from Indian attacks. They tried to keep white settlers from invading Indian lands. There were many fights between the soldiers and the plains Indians. The soldiers had more powerful weapons. They usually won. SARAH LONG: Some plains Indians tried to live peacefully with the white men. One such group was part of the Sioux tribe, called Santee Sioux. It was the largest and most powerful group in the west. The Santee Sioux lived along the northeastern edge of the Great Plains in what is now the state of Minnesota. They signed treaties with the government giving up ninety percent of their land. The Santee agreed to live in a small area. In exchange, the United States agreed to make yearly payments to the tribe. This made it possible for the Indians to buy food and other things from white traders. STEVE EMBER: Trouble started, however, in the summer of eighteen sixty-two. The government was late giving the Indians their yearly payment. As a result, the Indians lacked the money to buy food. The white traders refused to give the Indians credit to buy food. One trader said: "If they are hungry, let them eat grass." The Indians were hungry. Soon, their hunger turned to anger. Finally, the local Indian chief called his men together. He gave the orders for war. Early the next morning, the tribe attacked the trading stores. Most of the traders were killed, including the man who had insulted the Indians. He was found with his mouth filled with grass. The governor of Minnesota sent a force of state soldiers to stop the Indian revolt. The soldiers had artillery. They killed several hundred Indians in battle. They hanged several others. Soon, the revolt was over. SARAH LONG: Trouble came next to parts of Colorado and Wyoming. This is where the Sioux Indians and the Cheyenne Indians lived. The chief of the Lakota Sioux tribe was named Red Cloud. The Indians fought bitterly to keep white men out of their hunting grounds. After two years of fighting, with many deaths on both sides, the government decided the struggle was too costly. It asked for peace. The Sioux and the Cheyenne agreed. They were given a large area of land north of Wyoming in the Dakota territory. They also were given the right to use their old hunting lands farther north. The government agreed to close a road used by whites to cross the hunting grounds. And all soldiers were withdrawn from Sioux country. STEVE EMBER: The war ended and peace came to the Sioux and the Cheyenne. With peace came a new United States policy toward other Indians of the West. The government decided to put aside an area of land for each tribe. The land was called a "reservation." Each tribe would live on its own reservation. Most of the reservations were in Indian territory in what is now the state of Oklahoma. Other reservations were in Dakota near the land of the Sioux. 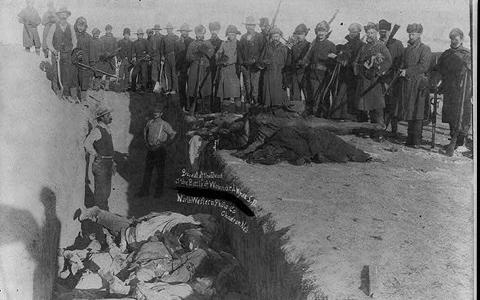 SARAH LONG: The government believed it would cost less money and fewer lives to keep Indians on reservations. The Indians would be away from possible trouble with white settlers. Instead of moving freely over the plains to hunt buffalo, the Indians would live in one place. They would receive food and money from the government. Officials came from Washington to explain this new policy to the Indians. A big meeting was held. Chiefs representing many tribes attended. The chiefs spoke, one after another, to the government officials. "There are things which you have said to me that I do not like. You said you wanted to put us on a reservation. You said you would build houses for us. I do not want your houses. I was born on the plains where the wind blows free, and there is nothing to break the light of the sun. I was born where everything breathed a free breath. I want to die there...not within walls." SARAH LONG: So the government and the Indians reached a compromise. The tribes were given reservations in Indian territory. But they were also given permission to hunt buffalo in a wide area south of the reservations. The Indians agreed to give up all their old lands. They agreed to live in peace on the reservations. In exchange, the United States promised to give the Indians all the food, clothing, and other things they needed. It also promised to give them schools and medical care. STEVE EMBER: The Indians were not happy with this agreement. They did not want to give up their old ways of living. However, they saw they had no choice. The government was too strong. They waited weeks, then months, for help to move to the new reservations. They could not understand the delay in carrying out the agreement. The delay was in Washington, D.C. Congress could not agree on how much money to spend on the Indians. So the lawmakers refused to approve the agreement. They left the situation unsettled. Again, Indians were forced to watch angrily as white settlers began moving onto lands they had agreed to give up. As the whites moved in, the buffalo and other animals left. The Indians had difficulty finding food. SARAH LONG: Soldiers shared their food with the Indians. It was not enough. Western officials sent urgent messages to Washington asking for supplies for the Indians. No supplies could be sent until Congress approved the money to buy them. As before, some of the Indians became angry and refused to wait any longer. Their anger led to new fighting. In the end, it was a fight that failed to win back their land. BOB DOUGHTY: Our program was written by Frank Beardsley. The narrators were Steve Ember and Sarah Long. Transcripts, MP3s and podcasts of our programs are online, along with historical images, at www.unsv.com. Join us again next week for THE MAKING OF A NATION - an American history series in VOA Special English.